Yes, you heard right, I said “tea dueling.” I just found out about this sport because a friend of mine took second place at CONvergence this past weekend in MN (Congrats Michael Sherman!). 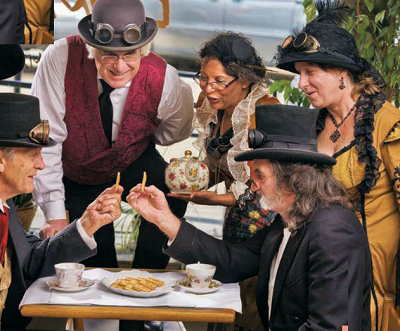 I am gutted that I had to miss it and MN Comic Con this year because of traveling, but maybe I will get to see some tea dueling at Weekend at the Asylum in September. Basically, a duel is a game of chicken between two competitors who have dunked cookies into hot tea. Their challenge is to be the last person to get the whole cookie into their mouth before it breaks, so they try to pysch-out the competition before their biscuit ends up in their laps. Sounds like good old civilized fun. Here is a video from DragonCon 2013.